V-Shaped Recession - What Does It Mean? 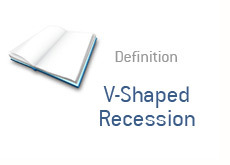 What is the definition of a V-shaped recession? Of the four, the V-shaped recession is the one most preferred by economists and government officials. In a V-shaped recession, you have a quick downturn in the economy (think of the first half of the letter V), which is followed by a quick recovery (think of the second half of the letter V). When it comes to a V-shaped recession, think "short and shallow". Many policy makers in Washington had hoped that the "Great Recession" would be a V-shaped recession when the downturn started in late 2007. However, things did not work out this way, as we are most likely working our way through a long U-shaped recession. A good example of a V-shaped recession came in 2001-02. In the aftermath of 9/11, the United States suffered through a recession. The US economy quickly got back on the rails though, and the recession proved to be a short one.